Who said you can’t make money betting? Many professionals create effective strategies to make a profit when betting. However, the vast majority of strategies are based on extensive data analysis and still rely on chance. Most bettors that rely on chance end up losing. However, there a number of simple systems that don’t require any knowledge of form — or even of sport — in order to generate profits. We’re going to look at one of those today. 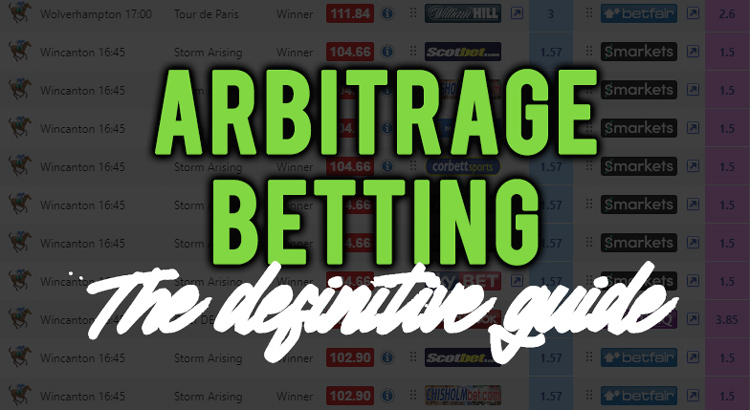 Arbitrage betting, also known as arbing, is something taken from stock markets and retail. In these instances, arbitrage is the action of buying an asset in one market to sell it simultaneously in another market at a higher price. The difference between the buying and selling price makes it possible to guarantee a profit. So how can we use this financial concept to make money in the betting industry? We’re going to teach you everything you need to know. How much profit can you make via arbing? Arbitrage betting involves the placing of bets on all possible results of a sporting event to make a profit regardless of its outcome. Arbers know their profit before a match even kicks off. This is possible because sometimes bookmakers have different opinions (and therefore different odds) regarding the probability of an outcome of an event. Or, they may make mistakes when offering overly-generous odds on a specific outcome. A discrepancy between odds offered between bookmakers and betting exchanges allows us to make a profit. Don’t worry if you didn’t completely understand the concept just yet. I’m going to explain two techniques you can use to leverage arbitrage betting and things often get more clear when we look at examples. Because arbitrage bets (known as ‘arbs’ for short) guarantee a profit, they’re often referred to as ‘sure bets’ — especially throughout Europe. Sure bets require a higher level of knowledge than the average bettor possesses, but this information is possible to learn extremely quickly. Everyone looking for consistent and steady profits can use arbitrage. However, you shouldn’t consider it a strategy to get rich quickly. In fact, it is not very common to find an arbitrage opportunity offering over 5% in profit. For example, if you staked £100 and earned £5 in guaranteed profit, this would be quite rare. Arbs of this size also come with their own risks that we’ll look at a little later. It’s very much a case of placing lots of smaller profit bets rather than trying to win big like most gamblers tend to do. You can bet multiple times a day, but the amount of profit you can make will depend on your bankroll, how many bets you place, the size of the arbs you take and more. Generally speaking, most people starting out with £500+ in their bankroll should make at least a few hundred in profit per month, but this is just a guideline. You should set up betting accounts with as many bookmakers as possible. You’re rarely going to use the same bookmaker over and over on any given day — you’ll use a range. Arbitrage opportunities are very common and crop up hundreds of times every day. However, it’s necessary to have an account with the relevant bookmaker to place the wager on the opportunity you found. If you need to spend time signing up after finding the arb, it probably won’t still be available by the time you’ve registered. Arbs come and go very quickly. As soon as bookmakers realise that they didn’t react quickly enough to odds movements, they change their odds — unless they’re intentionally trying to balance their book after taking too much money on one side of a bet. A key principle of a successful arbitrage strategy is the ability to react quickly when an opportunity occurs. We’re going to look at how to easily find arbs very shortly, but first let’s take a look at a simple example of how profit is generated. The easiest and most common way to do arbitrage betting is placing a bet on a bookmaker and then laying the same outcome on a betting exchange (i.e. Betfair or Smarkets). 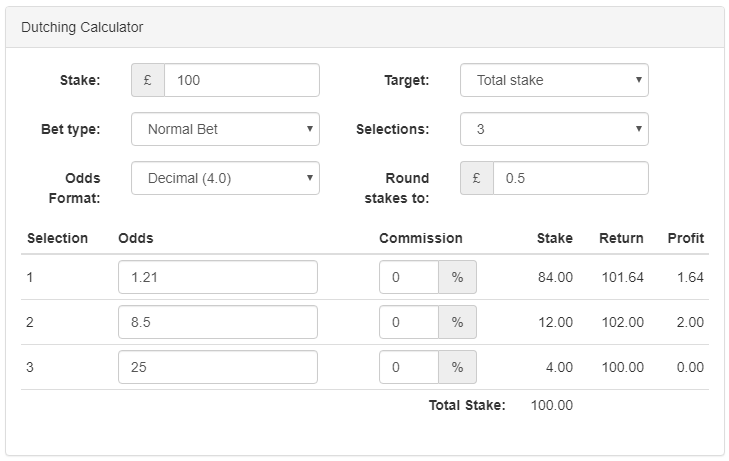 We can use a simple arbitrage calculator — the same as a matched betting calculator — to work out how much we need to bet against (i.e. ‘lay’) our bookmaker bet and to see how much profit we will make from the arb, too. Let’s say we’ve found a bet with odds of 2.06 on a bookmaker’s site, but the odds to bet against that team on the exchange are 2.0. We can easily see that after betting £100 on the bookmaker site at 2.06, we need to lay £104.04 on the team on the exchange at 2.0. We’ve shown the example using 2% commission at the exchange, but there are many 0% commission deals allowing you to make more profit than shown. On the example, we’d make a guaranteed profit of £1.96. If the bookmaker bet won, we’d win £106 at the bookmaker but we’d lose £104.04 on the exchange. If the bookmaker bet lost, we’d lose £100 there but then win £104.04 (minus commission, leaving £101.96) at the exchange. Betting exchanges are not available in every country. Fortunately, surebet opportunities between two bookmakers happen more frequently than people think. These can be used by all countries with bookmakers. When using two (or more) bookmakers to hedge across, we call this ‘dutching’ — rather than ‘backing and laying’ when we have exchange access. Using the same odds as before, we may find a tennis match where one player has odds of 2.06 and the opponent has odds of 2.0. (Please note: you must make sure the tennis retirement rules match up). 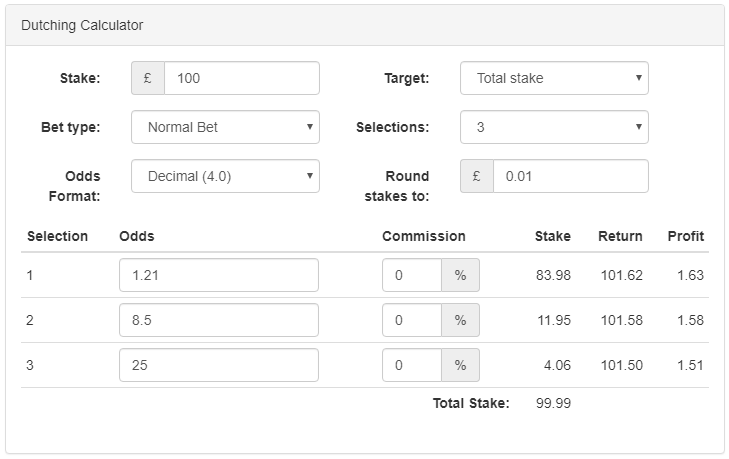 We can then use a dutching calculator to calculate the stakes and profit. 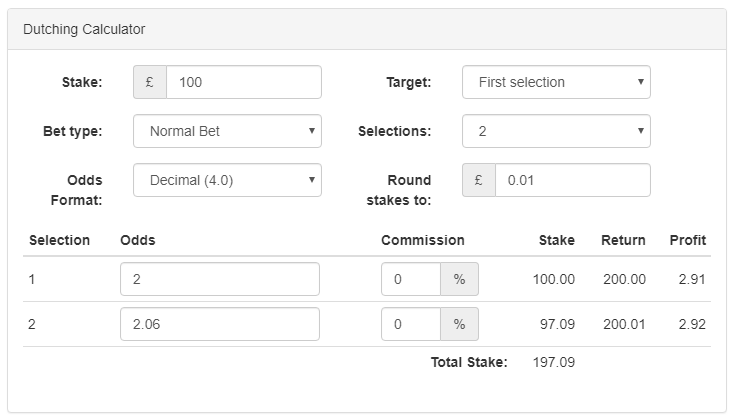 As shown in the image, if we bet £100 on the 2.0 selection, we can bet £97.09 on the selection at 2.06 and, regardless of who wins, we’ll make £2.91 (or £2.92 if it wins at the other bookmaker) in profit. This doesn’t just have to be done with two selections. In the world of football (soccer) we can find arbs to dutch across three separate bookmakers; one for each team to win and one for the draw. 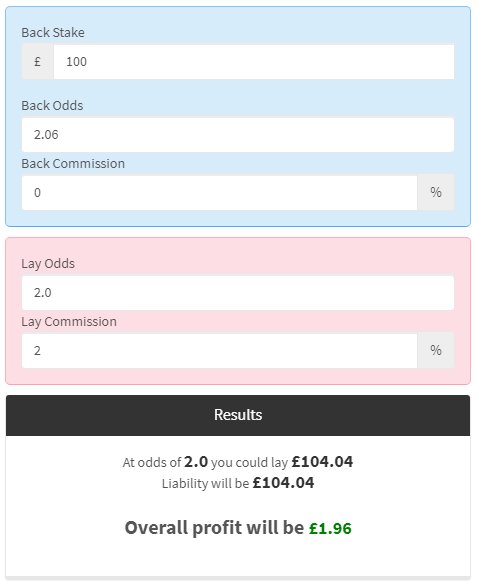 This arb was found by Oddsmonkey’s dutching matcher, and we can see from its 101.62% rating that it should generate a profit of £1.62 from a total stake of £100 — a 100% rating would imply that £100 staked would return exactly £100. Because the odds of each team are so far apart in this example, the return does vary ever-so-slightly depending on which site you win your bet at. As you can see from the profit column, depending on where you win, you’ll make somewhere between £1.51 and £1.63 in profit from your total investment of £100 (well, technically £99.99). Rounded stakes make your bets look less suspicious but they do change the profit levels — whilst the EV is basically the same, you can see that we’d only break even if the high odds selection were to win now, though we would make higher amounts than before on the other two selections. Things that seem too good to be true usually are, right? Many people say that the catch with arbing is that opportunities to find profitable bets are rare. This is not true at all. Depending on the number of bookmakers you have an account with, chances to use arbitrage betting arise multiple times every single day. When it comes to tax things are great too; gambling winnings are tax-free in the UK. Bookmakers don’t like it when you take advantage of them. The irony of this is quite astounding considering their whole model is based on them taking advantage of you. If you arb too often, your account will likely see promotional restrictions, stake restrictions, or account closures. You will be able to withdraw your balances and profits — they can not take these from you so don’t worry about that. Sometimes, locking in profit is possible when a bookie offers a price boost. Currently, on SkyBet, a treble of Bournemouth, Crystal Palace and Man Utd all to win is boosted to 12.0. However, on Smarkets, you can lay this off under their ‘acca’ section at 10.5, allowing you to guarantee yourself a small profit of around £2.30. You might laugh about the small £2.30 figure, but it only takes a minute to get the bet on and lay it off on Smarkets. SkyBet do a boost like this every week, meaning you could guarantee yourself an extra £130 a year just from doing these boosts. By getting on many other offers and boosts, over £1,000 can be made each month from matched betting. Because bookies know that they’re offering price boosts, you can do so with far less fear of repercussions, unless of course you completely abuse them and only ever do the price boosts and nothing else. With arbs, bookies don’t know that they’re offering them — they just know after that you’ve done them. Because they can’t stop you (like they can with price boosts) they are a real issue. Price boosts are relatively good when used sensibly. Arbs are really good for profit short-term, but they’re not good for the health of your accounts long-term. One of the main issues people foresee with arbitrage betting is that it would be time-consuming to find the right opportunities every day. We’ve already mentioned them a couple of times for their calculator and dutching software, but the oddsmatcher from Oddsmonkey will be able to identify arbs for you virtually in real time. Besides comparing odds from over 90 bookmakers and 4 betting exchanges, Oddsmonkey has many other features you can use to improve your betting experience. You can also combine arbing, Oddsmonkey membership and our Fortuneteller strategy if you have a larger bankroll to further advance your profit levels.